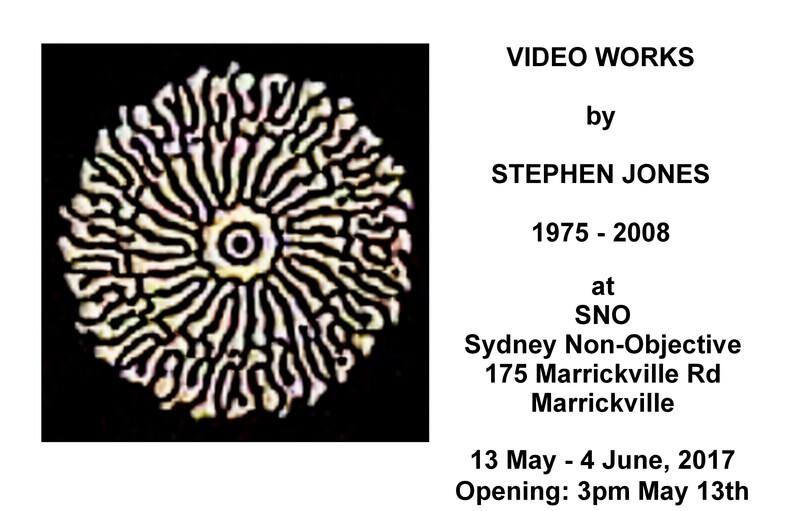 Stephen Jones (born 1951, lives in Sydney, Australia) is an Australian video artist of long standing. He was originally a member of Bush Video (1974-5). Over 1975 to mid-1976 he worked as a research assistant in the Psychology Department of the University of Queensland. While there he ran a series of workshops on video production in which he taught Architecture students from UQ and QIT and improvisational musicians and dancers from UQ. In 1976 he returned to Sydney and worked at the Paddington Video Access Centre for several years (1976-78). He also worked with Nam June Paik during his exhibition at the AGNSW in Sydney before providing technical support for many major exhibitions including the Sydney Biennales and Perspectas from 1976 to 1985. He curated VideoTapes from Australia (with Bernice Murphy) which toured the United States and Canada as well as being shown at the AGNSW and other venues in Australia (1979-81). I am writing in support of Paul Andrew’s ARI REMIX Project Stage Two 1980-Now application, with its special emphasis on the 1990-2000 era of Queensland artist-run culture and heritage. Although my period of involvement in the arts community of Brisbane was during the mid-1970s I am interested in participating and being interviewed for this project as that period provided the direct precursors to what happened in the 1980s and 1990s. It is important that these untold stories are put on the public record. At present they and the people who can tell them still constitute “living history” but if not gathered soon they will become forgotten because the people who were involved then are now somewhat older and have unknown time left. I have followed the project’s development so far covering the important period of the establishment of the first Brisbane ARIs in the 1980s, and feel that diversifying the project with additional 1980s artist-run content and a focus on “1990 to Now” artist-run heritage content will make this project an even more useful and diverse cultural experience for online audiences, users, artists, students and researchers. I have a small but significant amount of archival material to add to the remix.org.au project – including paper ephemera, videos, catalogues and written works, etc. – Teaching video production to students of the University of Queensland (UQ) and the then Queensland Institute of Technology (QIT). – Video production of my own and others’ works at the Brisbane Community Video Centre, then in Edward St, Brisbane. – Production of videos of performances by Noel Sheridan at the Institute of Modern Art (IMA), then in Market St, Brisbane, and students of the Architecture, Music and Human Movement Studies Departments of the University of Queensland. Some of these videos are still available. – Curation of exhibitions of local artists videoworks, especially with Dave E. Perry while he was the artist-in-residence at the Griffith University Film and Drama Centre, now Griffith Arts Workshop. I was educated at the Australian National University (BSc, 1973) in Canberra and then worked in Sydney in video media including community use of video, and electronic video and audio synthesis. I was employed, over the period from January 1975 to September 1976, as a research assistant in the Psychology Department of UQ on a project investigating the human use of the built environment, (e.g. the development of pathways through familiar and unfamiliar territories, body language studies, etc). While pursuing these studies I also worked as an artist and ran a series of workshops on the use of video as an artform, while having the invaluable opportunity to combine this work with the work of improvisational musicians and dancers from UQ and QIT. At the time I was in Brisbane there were few venues, institutions or galleries and (as far as I knew), no ARI’s in Brisbane. The Brisbane Community Video Centre and the fledgling IMA were the only places that approached that kind of function. The mid-1970s were a time of considerable political ferment in Queensland and the ARI’s of the 1980s were a direct result of the community organising that grew out of this ferment over the mid-to-late 1970s. Student group housing and political activism were the only available contexts for collaboration and development of an art practice and most of the ARI’s were in fact extensions of communal housing arrangements into communal gallery and exhibition facilities. Thus there were a number of individuals who I worked with who subsequently became valued members of the community of ARI’s in Brisbane. In 1982 he established the independent video production facility Heuristic Video, working with numerous video artists and independent video-makers. From 1983 to 1992 he was the video-maker for the electronic music band Severed Heads. Between 1989 and 1996 he worked as an engineer for several major video post-production and computer graphic production facilities. In 1996 he re-started his career as an artist and in 1998 received a New Media Arts Fellowship. He has had a major interest in the philosophical aspects of the nature of consciousness for almost longer than his involvement in video and produced The Brain Project web site [no longer online] between 1996 and 1998. In 1998 he produced a first pass of a history of the electronically generated image in Australia for dLux Media Arts with a symposium called Synthetics, which was presented at the PowerHouse Museum, Sydney, in July that year. He also built and showed The Reading Machine, a Brain Project installation at ArtSpace, Sydney, July, 1998. He has provided technical support for artists since 1976, developing sensor-controlled systems for interactive video/DVD installations and physical immersion installations, as well as developing theoretical perspectives on artificial intelligence and augmented environments. Since 2002 he has been researching the archaeology and history of the electronic visual arts in Australia. This work was his PhD project and the first stage of the history, to 1975, has been completed. He continues to be involved in technical support in the arts. In 2008 he was employed part time as an assistant curator at the Powerhouse Museum working on their Information and Communications Technologies collection. His curatorial interests include the understanding and development of networks of knowledge within organisations. In the last decade he has continued to develop the history of art and technology, computing and computer graphics, video art and new media in Australia and is presently involved in a project to restore and archive several important collections of Australian video art. This involves both gathering oral histories, documentation and ephemera of the works and the artists; and the digital preservation of much of the work that was made in the first two decades of video in Australia. His book Synthetics: Aspects of Art & Technology in Australia 1956-1975, was published by MIT Press in 2011.